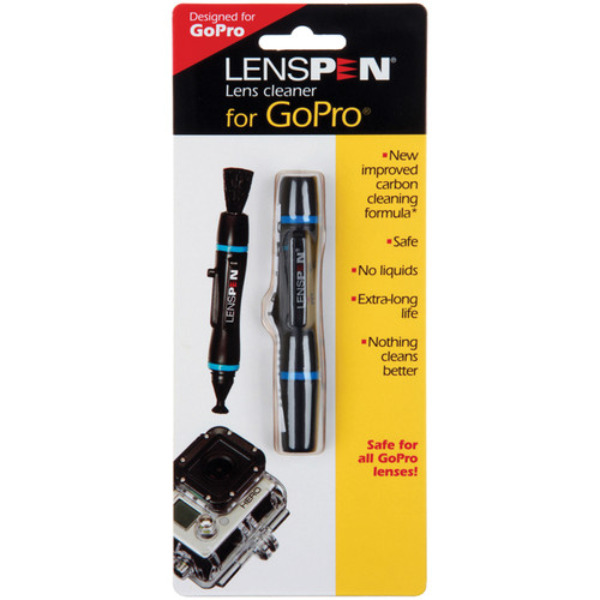 The LensPen for GoPro is a small, lightweight, pen-shaped cleaning tool, designed for camera lenses and other optical items. The Lenspen for GoPro is a small, lightweight, pen-shaped cleaning tool, designed for camera lenses and other optical items. Its 0.20" cleaning tip is slightly concave, making it useful for cleaning small GoPro lenses and filters. A retractable brush is built-in for dust removal. The invisible carbon cleaning compound contains no liquid, and is designed to never dry out. Put the replenishment cap back on after using the Lenspen and it will refresh the surface of the tip, assuring that only cleaning compound, not grease, will touch the lens on the next cleaning. This cap allows for a lifetime of about 500 uses.